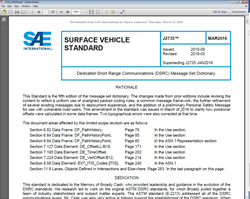 SAE International has published two important new technical standards that standardize the data message sets used in Vehicle-to-Vehicle (V2V) communications and establish the parameters for a vehicle communication system to receive and transmit the message sets. These cross cutting industry standards allow vehicle OEM’s and other developers to build interoperable V2V systems that will ensure that vehicles from different manufacturers are able to successfully communicate with each other. “V2V technology is an important and growing safety technology for future vehicles,” Jack Pokrzywa, Director of Ground Vehicle Standards for SAE International, said. “These new standards establish the parameters on how vehicles communicate with each other, thereby improving their safety effectiveness by designing interoperable systems." SAEJ2735™ - Dedicated Short Range Communications (DSRC) Message Set Dictionary is the fifth edition of the message set dictionary and specifies a message set, and its data frames and data elements specifically for use by safety applications intended to utilize 5.9 GHz DSRC for V2V communication systems. This standard also supports interoperability among DSRC applications through the use of a standardized message set, and its data frames and data elements. 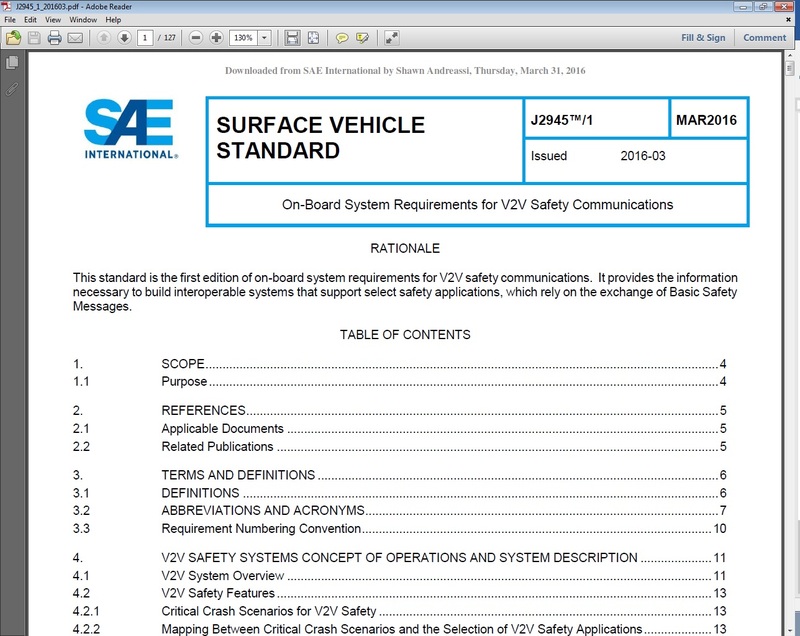 Common and interoperable message sets are the cornerstone of V2V safety applications. SAE 2945™/1 - On-Board System Requirements for V2V Safety Communications is the first edition of on-board system requirements for V2V safety communications and specifies the parameters for a system to transmit and receive the SAE J2735TM-defined safety messages over a Dedicated Short Range Communications (DSRC) wireless communications link. It also ensures that the exchange of safety messages in V2V safety communications provides the desired interoperability and data integrity to support the performance of the envisioned safety applications and provides the information necessary to build interoperable systems that support select safety applications. It is expected that both standards will be cited in the National Highway Traffic Administration’s (NHTSA) upcoming Federal Motor Vehicle Safety Standard Number 150 (FMVSS 150) rulemaking which will require vehicle-to-vehicle (V2V) communication capability for light duty vehicles and create minimum performance requirements for V2V devices and messages. 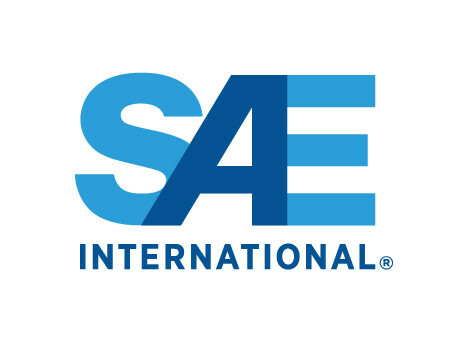 Both standard are available on SAE International’s website, http://www.sae.org. Credentialed journalists interested in seeing a copy of the standards should email pr(at)sae(dot)org or call 1-724-772-8522.